On Saturday, Dec. 22, Cirque du Soleil and Blue Man Group brought their imaginative acts to the T-Mobile Arena as they performed on ice during two intermission breaks at the Vegas Golden Knights game against the Montreal Canadiens. Before the intermission performances and to mark the start of the game, audience members enjoyed the Canadian National Anthem serenaded by Rochelle Collins, regularly seen on stage at KÀ at MGM Grand. 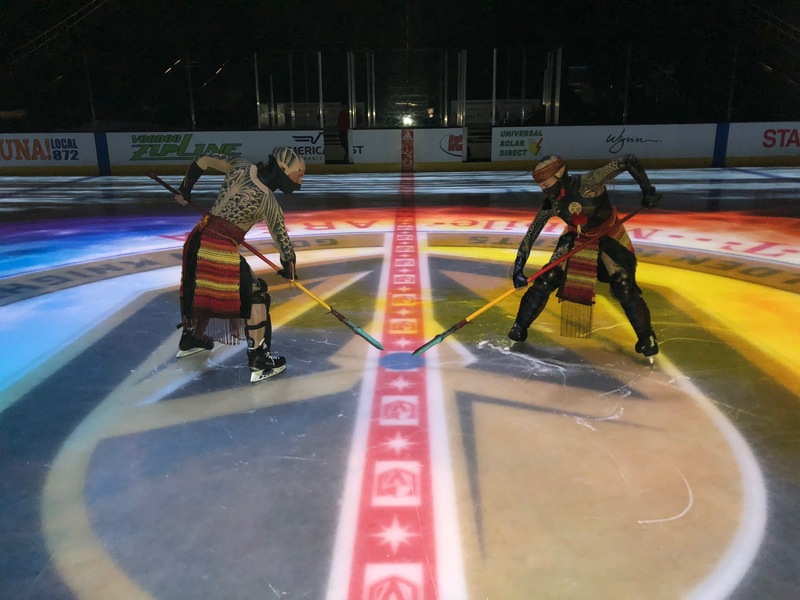 During the first intermission, 25 cast members of the fan-favorite resident show KÀ, dazzled the audience as they rappelled from the ceiling cascading to the ice. Drawing inspiration from KÀ’s theme, a theatric battle took place between the imperial court and the chief archer and his spearmen when the court’s festivities were interrupted. For the second intermission performance, Blue Man Group awed audience members with a one-of-a-kind musical performance of Creature Feature, an exclusive piece found only in their Las Vegas production. Featuring electrifying sounds made with unexpected instruments, like the Percussipedes and the Chimeulum, Creature Feature concluded with a unique tribal drumming experience that only the Blue Men could create. Attendees also enjoyed KÀ and Blue Man Group virtual reality experiences on the plaza ahead of the game and were able to pose for photos with interactive billboards as their backdrop.